Sourdough blueberry pancakes are super easy to make. If you are still struggling to attain the perfect light, crusty sourdough loaf, you may find sourdough blueberry pancakes easier to manage. You can make them without milk or dairy substitutes. You begin with your sourdough starter. Take your sourdough starter out of the fridge. If there is a layer of brown liquid on top of the starter, pour this off. You should have 1 cup of starter. Feed your sourdough starter with 1 cup of whole wheat flour and 1 cup of water. Cover it and let it sit at room temperature for 4 hours. If you use your sourdough starter weekly it will be active and you will be able to proceed with the next step immediately. If you use your sourdough starter infrequently, it may take a bit more effort to get it active and bubbling. 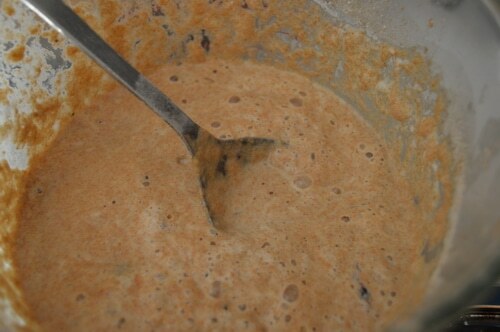 If it’s not active in 4 hours, remove 1 cup of the starter and discard. Add 1 cup of water and 1 cup of flour and wait an additional 4 to 8 hours. 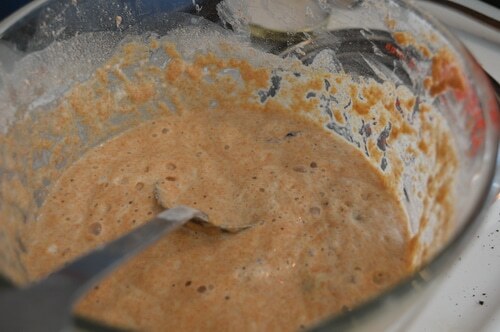 Repeat this until your starter becomes active and begin to bubble after you add the flour and water. Once your sourdough is active add 2 cups of whole wheat flour and 2 cups of water and cover. Let it proof overnight. – at least 8 hours. It will get bubbly and increase in bulk. Remove 1 cup of the starter and put it in a jar and return it to your fridge. Now you are ready with the remaining 2 cups of starter to proceed with making your pancakes. Additional blueberries for topping the pancakes. Optional toppings: whipped cream, maple syrup. As mentioned above, begin the night before by adding 1 cup of flour and 1 cup of water to your 2 cups of sourdough starter in a bowl. Cover with an airtight lid or plastic wrap. Allow to sit overnight at room temperature. In the morning take 1 cup of starter and return it to your jar. You’ll have 2 cups left for your pancakes. To the 2 cups of starter add your eggs, and vanilla. Mix well with a wooden spoon. Stir in flour and baking soda. Your batter should be the consistency of cake batter. Fold in blue berries. Preheat a frying pan or griddle over medium heat. Grease pan with 1 tbsp. of coconut oil. Drop batter by spoonfuls into hot oil. Fry on one side until bubbles form on the uncooked side of the pancake. Flip pancake and cook the other side. Continue cooking until the pancake is golden brown on both sides. Reserve the cooked pancakes in a warm oven until ready to serve. 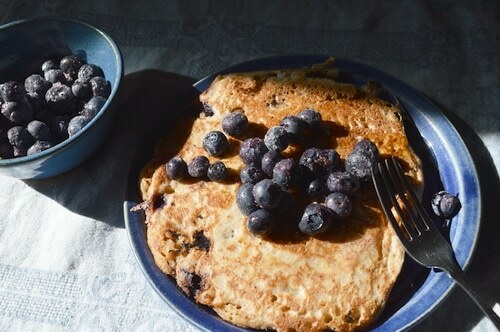 Continue cooking your blueberry pancakes until you run out of batter. Replenish the oil in the frying pan as often as necessary. 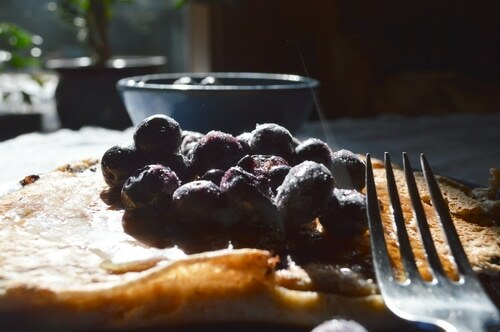 Serve with fresh or frozen blueberries, butter, and maple syrup for sourdough blueberry pancakes that are hearty and tasty. These are blueberry pancakes they’ll ask for again. The secret to perfect pancakes is to preheat the pan with the oil before you begin. The pan should be evenly hot and water drops sprinkled on the surface should sizzle and evaporate immediately on contact. Once the pan is hot enough, test with a silver dollar size pancake for even heating. 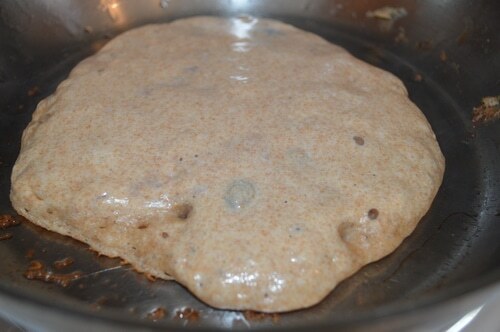 Cook on one side until bubbles form evenly on the top, but the batter is still liquid on the top of the pancake. Flip the pancake and cook on the other side until golden brown. Keep the pancakes warm until you are ready to serve them. Don’t reheat them in a microwave. The pancakes will become rubbery and dry. If you need to reheat them put them back into the frying pan and warm briefly on both sides before serving. In our house, I serve pancakes hot as they come off the griddle. It becomes a leisurely weekend breakfast with conversation as the pancakes are cooking and plates are being refilled. These pancakes are not the light, fluffy pancake mix kind. These have body and texture. They are the pancakes that the Gold Rush Miners thrived on. One pancake is very filling. You won’t need to eat a whole stack of them to feel satisfied. For this recipe I ground my own wheat using my Wondermill Grain Mill. A hearty pancake recipe that will be asked for again and again. To the 2 cups of prepared sourdough starter add your eggs, and vanilla. Your batter should be the consistency of cake batter. Preheat a frying pan or griddle over medium heat. Grease pan with 1 tbsp. of coconut oil. Drop batter by spoonfuls into hot oil. Fry on one side until bubbles form on the uncooked side of the pancake. Continue cooking until the pancake is golden brown on both sides. Reserve the cooked pancakes in a warm oven until ready to serve. 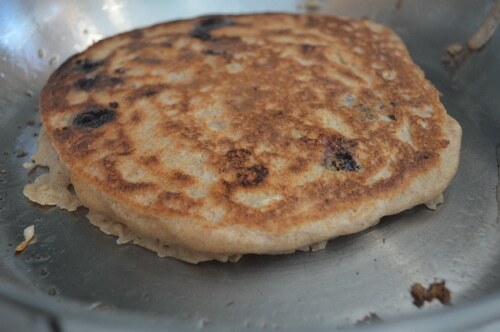 Continue cooking your blueberry pancakes until you run out of batter. Replenish the oil in the frying pan as often as necessary. Serve with fresh or frozen blueberries, butter, and maple syrup for sourdough blueberry pancakes that are hearty and tasty. If your family prefers a sweet pancake, you can add a small amount of sugar to the recipe. However, the blueberries do add a touch of sweetness, as does slathering them in maple syrup. How to make sourdough starter from scratch. How to grind your own wheat flour. These sound great….I have made sourdough waffles before but have never tried pancakes. These look wonderful! I really need to start making sour dough….